Live life. Test your limits. Weather – how many different ways can you say rain? We woke up to rain this am at 6. However by 930 when we said a tearful goodbye to Charles the sun had come out. It was about 33 degrees. We climbed steadily out of the valley to an old monastery that was mostly abandoned. 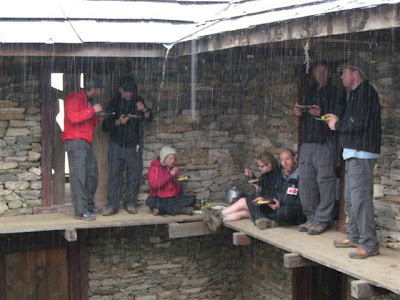 As we waited for lunch the skies again opened up and the rains came down. This time with a vengeance. Lunch was goat liver (I asked Dale how long he thinks we will eat goat and he figures about 20% of the goat is being consumed per day so hopefully only 4 more days [I don’t think we should sell goat at the Tibetan bread stand, unless Stella you think you can cook it well]). We perched for lunch on the 2nd floor of the deserted monastery looking in on the inner courtyard while the rains came down. There was a small family living at the monastery, one of the women admired the beads that I have carried (thanks Jason). They have become a talisman for me. Now please close your eyes and imagine. That’ not going to work is it – actually how about if you just imagine. An eavestrough about a boot and a half wide, full of leaves and dirt, at a 15 degree angle, draining the runoff from Niagara falls. That is what we hiked up this afternoon. After a couple of hours of eavestrough walking we arrived in Pangom. The good news was that we had a lodge, small but wonderful. Even better I broke out the tunes with my iPod and tiny speakers. At present Bob Marley is playing away. Anything to lift spirits. Housekeeping is a challenge. We were only allowed to bring 25kg of gear. Sounds like a lot but when you add the sleeping bag, tent, warm gear, spare boots it doesn’t leave much room. Hence we are always trying to clean clothes. The problem is, with the damp weather things just don’t dry. 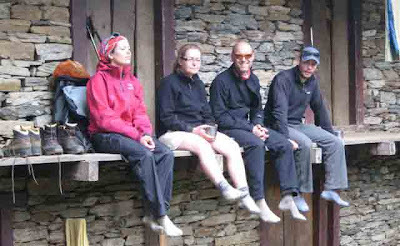 This is a constant for us – damp clothes, boots, socks etc. We go up and up from here – planning to hit a 5300m pass in three days?! Dave is thrilled about this because he seemed to attract all of the flying beetles into his dinner last night. These should be less of a problem once we go higher. The adventure continues! Just remember, in 20 years you won’t remember your wet feet. Goat can be delicious, just tell them that you’d like it grilled to medium rare with a rosemary and olive oil rub. Then chase it with some scotch. I hope that all your spirits are high (on sunsets, not opiates) and that the rain stays a your back. Following from van, again living vicariously through my dad – @#$%&? I can do goat– agree with dale jr, except I would start with the scotch, then proceed with the rosemary infused goat. O.K maybe we will pass on the goat at our stand. Lets go with some pasta, cappelini with light tomato sauce….sorry sorry what am I doing??? You guys are all so inspiring. Dale, I am so proud of you!!! Pictures are great. glad to see someone finally got your goat. I just wanted to know if you could tell if the set of hips was from a male goat or a female? I have tried to write before this many times but for some reason today it’s happy. The blog is great everyone is hooked on it. You have the rain,we have the cold. I think spring is waiting for you to return. Hope all is well there,as it is here,Take good care of each other and tip those sherpas real good!! Register! Log in! Follow! Comment! a. Open the desired blog entry you wish to comment on. b. Scroll down to the bottom of the post. c. In order to leave a reply, you must LOG IN or REGISTER with a username and password. d. Once you are logged in, a comment box will appear at the bottom of each blog post. Enter your reply here and post a comment.